Hello from Flattop Mountain in Anchorage, Alaska! We are on day 3 of our Arctic research journey to collect heat flow and chirp seismic data in the Beaufort Sea. 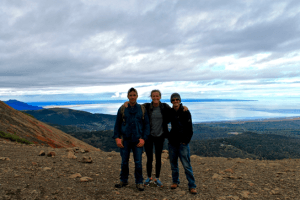 Here are the scientists (minus me): Dr. Matt Hornbach (SMU), Dr. Rob Harris (OSU), Casey Brokaw (Master’s student, SMU) and Dr. Ben Phrampus (Postdoc, OSU and SMU Alum). We’re currently hanging out in Anchorage, AK until the weather and seas calm down a bit at our dock site in Wainwright, AK. The flight to Wainwright was supposed to take place this morning but fog, wind and rough seas expected to last through tomorrow have postponed the last leg of our trip an extra day. So… what do you do when you can’t board your ship? Hike! 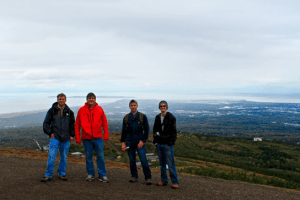 We hiked up Flattop Mountain taking in the sights of Cook Inlet and enjoying the cool weather, which has been a nice break from the long and very hot Texas summer. More updates to come… Wish us luck!